John Kasich: 2016 Voters 'Hearing All Kinds Of Crazy Things' : It's All Politics In any other year, a popular governor of Ohio might be an ideal GOP presidential candidate. But this isn't any other year, as Kasich acknowledged in an NPR interview. Ohio governor and Republican presidential candidate John Kasich speaks to reporters following an Americans for Peace, Prosperity and Security national security forum in Concord, N.H., in September. In the midst of a primary campaign that has frustrated the fortunes of establishment candidates, it's striking to hear Ohio Gov. John Kasich say, "I don't get angry about many things in life these days." That's even more striking because he was referring to a recent spat with Donald Trump, one of the political outsiders who are leading the Republican presidential field. In any other year, Kasich might be an ideal GOP candidate. He's the two-term governor of Ohio, a pivotal swing state that Republicans have never won the White House without. Kasich was re-elected in a landslide last year and his approval ratings in Ohio remain very high. But this isn't any other year, which Kasich acknowledged in an interview with NPR as he was preparing to depart Ohio for Wednesday night's GOP debate in Boulder, Colo. In this campaign, Donald Trump has dominated the headlines and the polls. Over the weekend, he claimed credit for something Kasich touts as a major victory in his home state. Trump has been criticizing Ford's decision in April to open factories in Mexico to build engines and transmissions. But Ford says it is not canceling that deal. Fact checkers call Trump's claim "bogus." The real story appears to be this: Ford has decided to move some pickup truck production from Mexico to Ohio, but that deal was announced back in the spring. And Ohio's governor is proud of it. "I went to Detroit and had a lot of meetings with the auto companies," Kasich said, referring to the time shortly after he took office in 2011 when Ford received state tax incentives. That benefit has been traced to the decision to move the truck manufacturing back to Ohio. Ford executives have criticized Trump and praised Kasich in response to the flare-up. Without naming Trump, Kasich said, "Anybody else that's in here trying to say that something they did today affected something in 2011 must be living in a time machine or something." "Look, we're hearing all kinds of crazy things right now on the campaign trail," Kasich added. "One of the guys wants to abolish Medicare and Medicaid. Another guy wants to deport 10 million people out of America." There, Kasich was referring to retired neurosurgeon Ben Carson, who recently talked about replacing Medicare and Medicaid with private health savings accounts but later insisted he wasn't proposing the elimination of the programs. Kasich also sounded like he was calling out Trump, who has repeatedly talked about deporting millions of immigrants who are in the country illegally. But Kasich refused to attack them directly. When pressed on whom he was referring to, Kasich said, "Everybody wants me to start attacking people by name. You all figure out who I'm talking about." In Wednesday night's debate, it may be harder for Kasich to avoid directly confronting his rivals. Especially if they push those kinds of proposals that Kasich refers to as "fantasy claims." "The public needs to understand that those kinds of things are, frankly, reckless," he said. Helping the public understand that is Kasich's mission, as he trails far behind Trump and Carson. He averages less than 3 percent in national polls but dismissed those numbers. "They are basically a distraction. 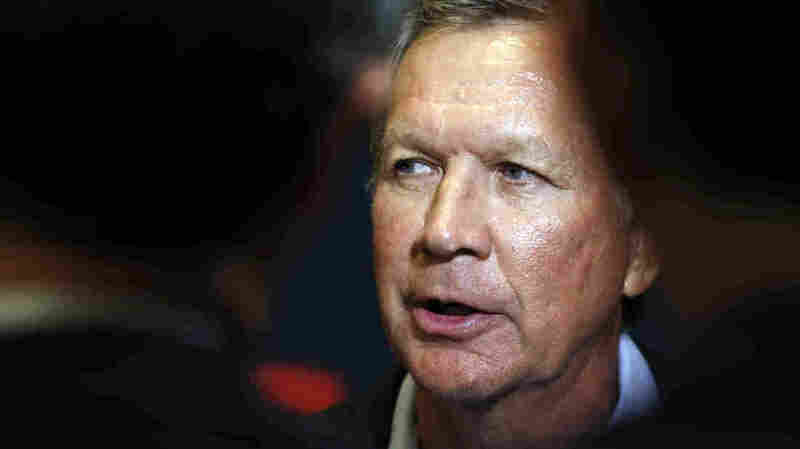 It's like a game," Kasich said. "That's not how we elect our presidents." And he's right. The battle for the Republican nomination is fought state by state. Kasich has not been investing much in Iowa, which is dominated by religious conservatives who would not be likely to support him. New Hampshire is friendlier territory for more mainstream, establishment Republicans like Kasich. He has been clear that it's an important state for his campaign. But even in New Hampshire, Kasich is stuck in the middle of the pack. Trump and Carson dominate there, too. "Well, I think the people are unsettled," Kasich said of GOP voters' reluctance to support establishment candidates. "I think they're saying, 'OK, we've tried these folks and it hasn't worked. And so therefore we ought to look somewhere else.' "
The problem is that Kasich's candidacy is predicated on his long record in government. He talks up his experience in Washington during the 1990s, when he was chairman of the House Budget Committee and the federal budget was balanced. In Ohio, Kasich takes credit for the state's big turnaround since the recession. The state budget is in much better shape than when he took office nearly five years ago, and the unemployment rate in Ohio has dropped with the rest of the country during his tenure. Kasich insists that it's not too late to sell his effective governing experience. "We've got a long way to go. A long way to go," he told NPR. With a little more than three months left until the New Hampshire primary, Kasich has a steep climb to convince Republican voters that his resume is right for the job in 2016.